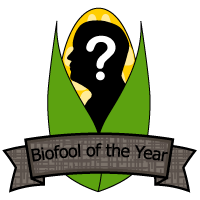 Vote For the 2011 BioFool of the Year for April 1st: Friends of the Earth U.S.
Friends of the Earth U.S..
Vote at the link above and to read more. According to Friends of the Earth, it has been a good year for Biofools: ethanol subsidies were slipped into the December tax cut deal, EPA approved a 15 percent ethanol blend for cars up to a decade old, and the oil spill in the Gulf of Mexico covered up that region’s other ecological disaster — a dead zone the size of Massachusetts caused by agricultural runoff from the Midwest. Earthwatch: Mammals of Nova Scotia – Earthwatch. Complete information available at the above link. You’ll monitor mammal populations to determine the impacts of climate change and other environmental challenges. Working in diverse habitats, from forests to meadows and from wetlands to sweeping beaches, you’ll use various methods to monitor Nova Scotian wildlife. You’ll observe the behavior of raccoons, beavers, skunks, and porcupines, and establish the locations of dens and wildlife trails. You may also use infrared video surveillance and camera traps to monitor more elusive animals such as fisher (a type of marten), coyote, or bobcat. You’ll use trapping grids to sample rodents and shrews, and count deer and snowshoe hare droppings to estimate their population densities and habitat preferences. You may also be involved with using bat detectors to count bats, sampling invertebrates, surveying seabirds, and watching for marine wildlife. In your recreational time, you can go to the waterfront town of Lunenburg and visit museums, see the famous racing schooner Bluenose, check email, and enjoy the shops. Geologically, the province of Nova Scotia is the oldest part of the North American Shield. It is almost completely surrounded by the Atlantic Ocean, connected to mainland Canada’s east coast by a tiny piece of land. Across the Bay of Fundy from Nova Scotia is New Brunswick, Canada, north of the state of Maine in the United States. A large part of the province, Cape Breton, is an island connected to Nova Scotia’s mainland by a causeway. The province is twice the size of Massachusetts, and just a bit smaller than Ireland. Wherever you go in Nova Scotia, you are no more than 56 kilometers (35 miles) from the sea. Nova Scotia’s highest point, on hilly Cape Breton Island, is White Hill Lake at 530 meters (1,742 feet) above sea level. The lowest lands in the province are actually below sea level, in the Annapolis Valley. Huge dikes hold back the sea and create thousands of acres of farmland. Much of the middle and upper parts of the province are rocky highland plateaus reminiscent of the Scottish landscapes of many of the province’s ancestors. Cook’s Lake, a focal area for the project, is more than just a lake: The area contains some 330 acres (134 hectares) of mixed coniferous and deciduous woodland, hay meadows, ponds, streams, and wetlands. This woodland has been owned by the family of Earthwatch scientist Dr. Christina Buesching for 20 years as a haven for wildlife.